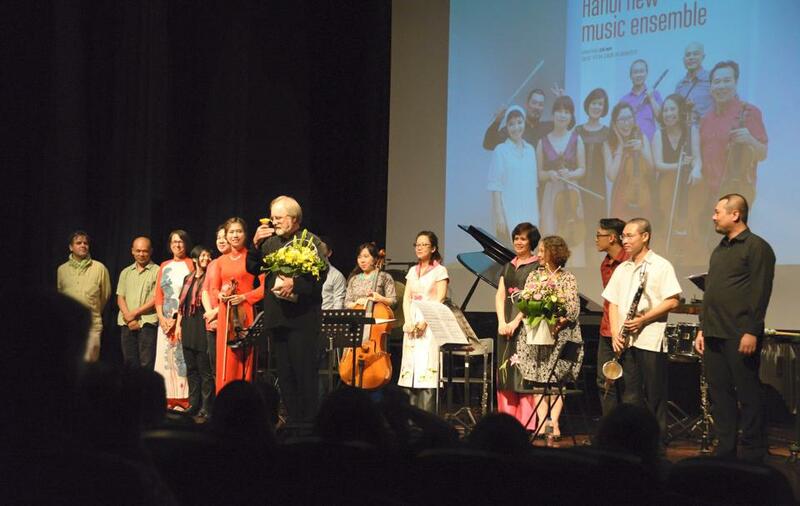 Presenting a flower to a large and appreciative audience in Hà Nội. 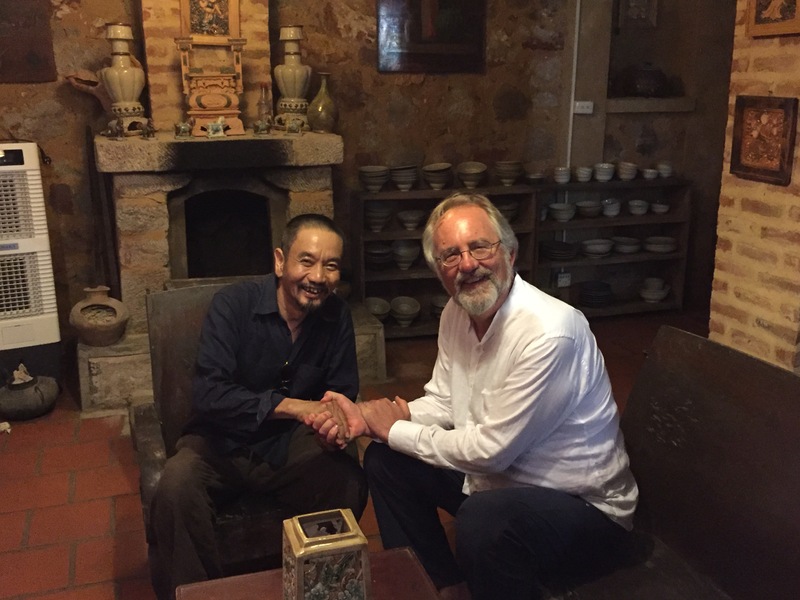 We already began a behind the scenes collaboration with my friend Đàm Quang Minh of the Ancient Music of Tonkin group for a performance of Trần Kim Ngọc’s Phục Hốn Kính Tặng Cha, a piece inspired by a Buddhist ritual for the departed. Where I heard dragon mouth woodblocks, Buddhist prayer bowls, rich pitched gongs, my young percussionists Lu Cương and Fin Vũ only seemed able to provide bad Western alternatives. So we turned to Đàm Quang Minh for support. 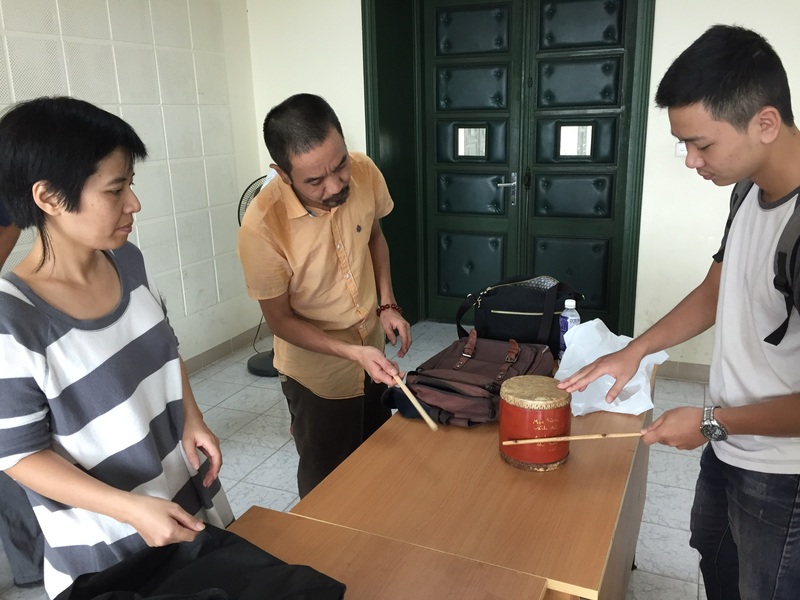 Getting the right sound as Trần Kim Ngọc looks on at a ca trù drum demonstration by Đàm Quang Minh to Lu Cương. Because composers live and come out of a precise sound world. 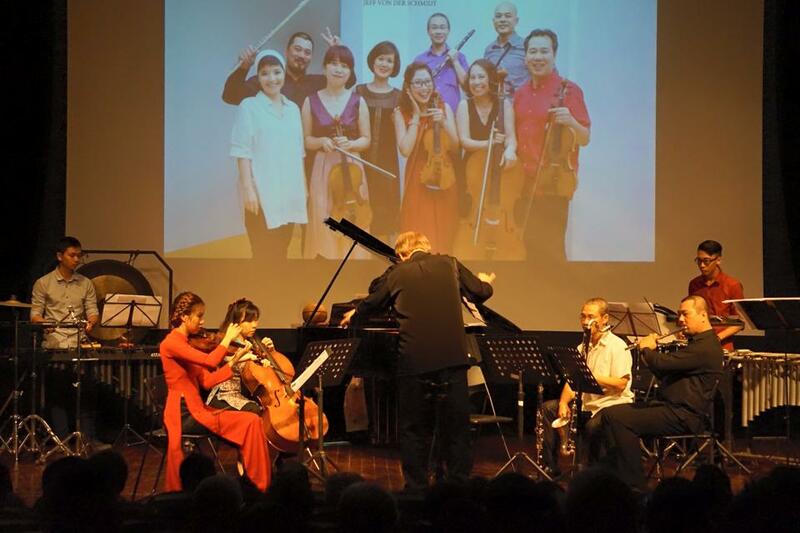 And the one element consistently found in each of the leading composers of Việt Nam, the late Nguyễn Thiên Đạo, the venerable Tốn Thất Tiết still vibrant in Paris, and the young leaders in Hà Nội, Trần Kim Ngọc and Vũ Nhật Tân, is a thorough and profound knowledge of their music. 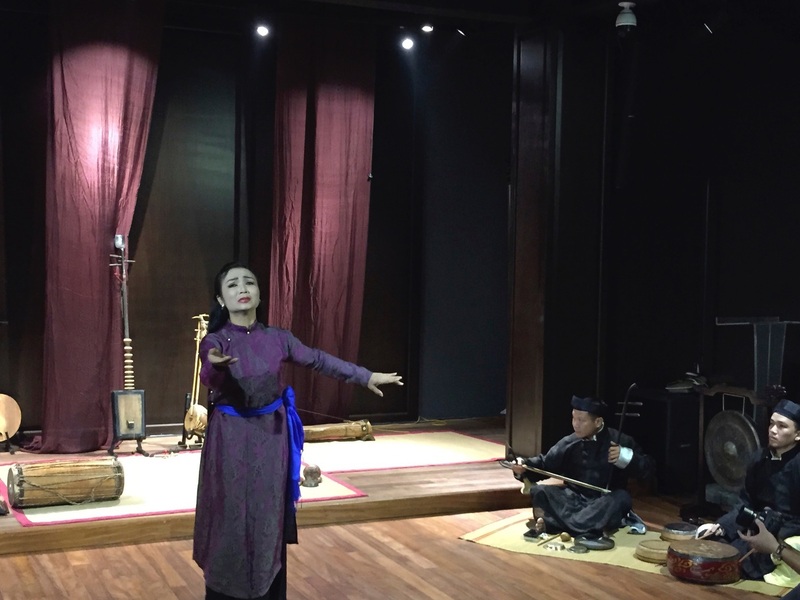 The vast inspiring world of the ancient music of Việt Nam. Vũ Khánh Linh and Giang Dương creating exquisite Vietnamese colors for Trần Kim Ngọc. 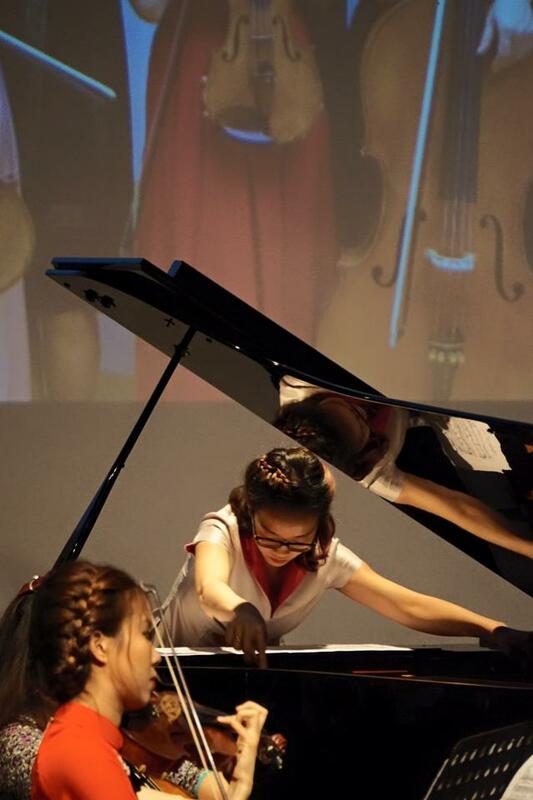 A deft northern monsoon wind was easy for Tam Ngọc Trần to convey with extensive inside the piano poetry. Finally in Hà Nội, doing our best for Trần Kim Ngọc with a Vietnamese premiere for her Phục Hồn Kính Tặng Cha. Here is our program for November 4th. 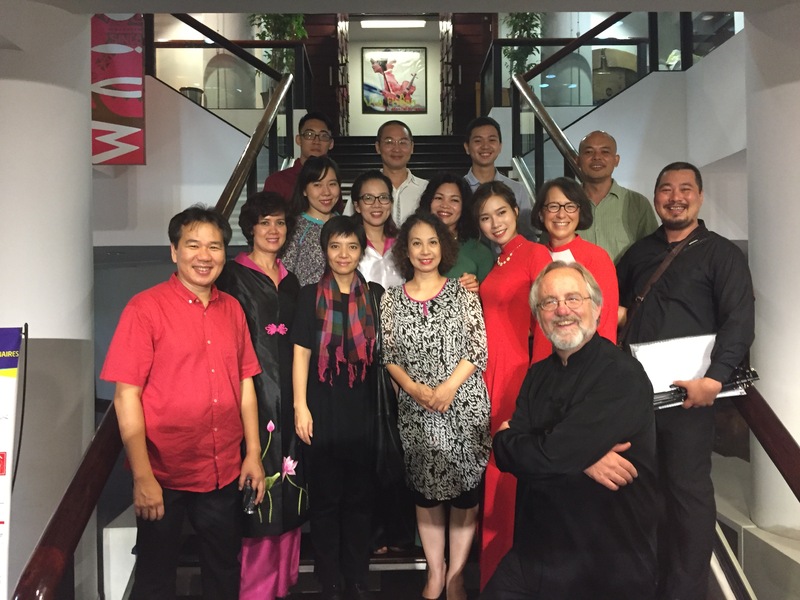 Each journey begins slowly and this first step between the Ancient Music of Tonkin and the Hà Nội New Music Ensemble adheres to this obvious wisdom. We crawl before we walk, and we walk before we run. The Ancient Music of Tonkin group in rehearsal. 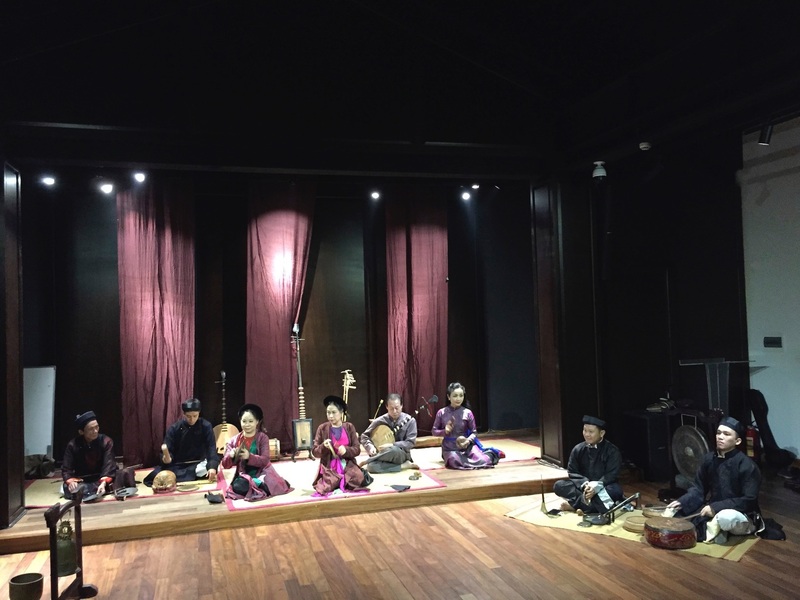 The collaboration between the Ancient Music Ensemble of Tonkin with the Hà Nội New Music Ensemble will begin by going as far back in time as possible, to a medley of ancient songs called The Communal House Door Songs. Việt Nam remains a Confucian country, where family organizes life, togetherness is everything. I am no longer scared of the chaotic traffic world of Hà Nội. Now I understand that it wouldn’t occur to any Vietnamese to run into you or that you would not support their need to turn against traffic in spectacular choreography. Something the French and Americans would learn the hard way in the 20th century. They are all in this together. Essential and happy group photo after a successful opening concert. l’ll admit something. I am allergic to what I call over-simplification disease. Bullet points, Twitter, endless lists of “how to walk” or “how to eat”, Bugs Bunny and Beethoven in the constant same breath, all this, and much more in this toxic political season, points to a lack of cultural discernment. And so though I love Asia, I am rarely if ever enthusiastic about the prevailing winds here about classical music, which often exists subconsciously as a marketing tool for a massive status symbol industry. Western exploitation smacks of a nouveau cultural colonialism, for example when DGG records the Beethoven 5th and Emperor Concerto in South Korea (yes, I am aware they probably made money). Accurate awareness of style? Judicious programming? The answer is usually don’t disturb my Chopin trance or can we play the Beethoven 5th again, maybe Mahler? Stravinsky? Who’s that? The Ancient Music Ensemble of Tonkin. Allow me to venture into deep waters and sketch a major theme, and trust that I am working on a substantive book that will allow my subject to develop significantly beyond a blog post. In Asia, when Western music is taught, it is elevated onto the level of a paradise, a world that demands conversion at any cost. The ancient music of your country? Usually neglected or at best transformed into a tourist trade equation, but always, I will use obscene words here, colonized by the imperial music of Europe. Segregation comes to mind about the two musics. Enter the questioning minds of the creative community, collectively stepping into the vacuum of cultural leadership. Because as I already said, a profound knowledge of their ancient music informs the thoroughly demanding scores of my favorite Vietnamese composers. So here is my theme. Digging around Hà Nội for the real sound of Việt Nam with Vũ Nhật Tân. And to sketch out my thought a little more, new music is where the cultures begin to meet. Once Debussy destabilizes Teutonic development there is no going back. Marry this French perspective to the destablilizing rupture coming out of the Second Viennese School, followed by the devastation of World War II, and you’ll understand why John Cage studies with Arnold Schoenberg in my hometown of Los Angeles and during his lifetime receives the Kyoto Prize from the Japanese as a revered sage, far in advance of his now iconic status. I like to teach by thought experiment. Imagine Benjamin Britten, John Cage and Pierre Boulez trapped in a elevator for three hours waiting to be greeted by Tốn Thất Tiết or Toru Takemitsu. Where was the elevator, Paris, Hanoi, New York City? What would they have in common? How would they contradict each other, or compliment each other? What would Tiết or Takemitsu say to them once the elevator was repaired and they emerged from a long conversation? OK, you can see I’m writing a book about the subject! 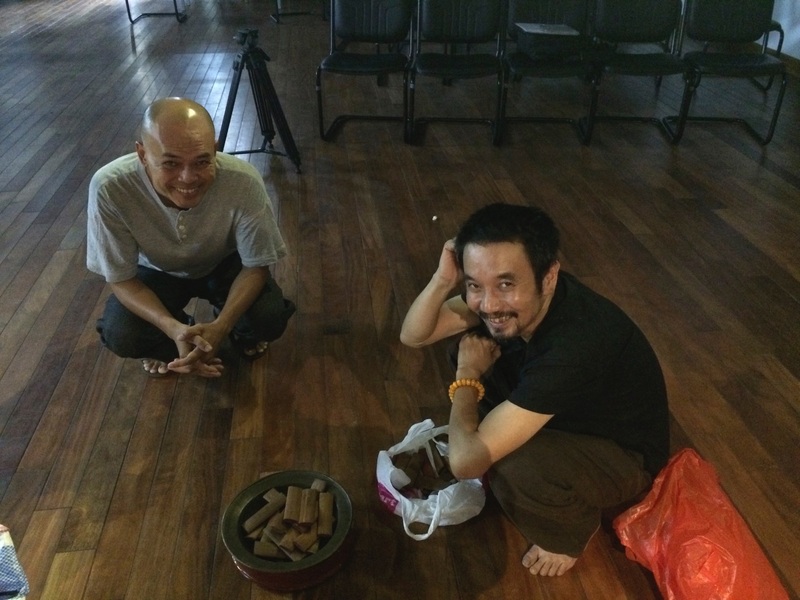 Vũ Nhật Tân and Đạm Quang Ming, leaders of ancient and new music in Hà Nội. However the idea of combining the old with the new is also not new in the West. Jan and I are lucky indeed to have co-produced a concert for the bicentennial of Los Angeles with a legend, Lawrence Morton of the Monday Evening Concerts. 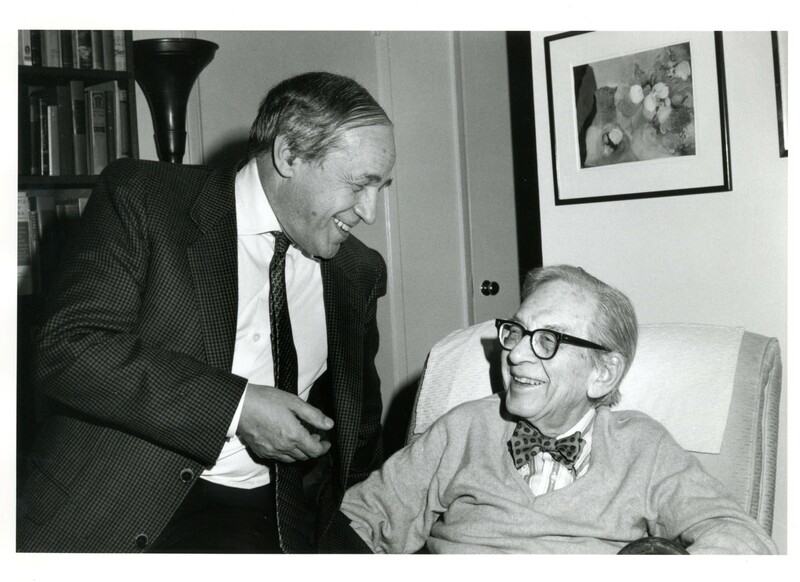 For his generation, combining Machaut or Monteverdi with the newest piece by Igor Stravinsky was expected, and they all lived a few blocks from where I grew up in West Hollywood. Pierre Boulez on Sweetzer Avenue in West Hollywood visiting one of my mentors, Lawrence Morton (photo by Betty Freeman). I know I stress the obvious, but I must say combining the early instrument world with with the new music community has never truly coalesced into a movement in the West, with rare exceptions (and those are usually in the Netherlands). The stakes in Việt Nam are different, much different. We aren’t talking about neoclassic issues here (which are at the root of Stravinsky’s fascination with the medieval past) but we are talking about claiming a sound world that is unique to a national identity. And that notion, of pure sound, creates a bridge to the West, be it the swirling infused gamelan dreams of late Debussy or Boulez, the cage-free world of pure sound and Zen instructions from John Cage or the current potentials of technology. Because the goal of the Asian musician is to create a natural sound world through the instrument. The goal is evocative sound, not the spinning of notes through a complex web of theme and developmental variation. This is a world where verbs aren’t conjugated into past, present and future. There is one tense that can only be modified. And that tense is global. Which means the sound world is different here, where we shape sound, they curve music. And silence allows the listener imaginative space. Đào Tuyết Trinh plays Tiết’s Voyage. This admonishment of Tiết’s infuses his solo cello work Voyage. Written for the Indian cellist of the Arditti String Quartet Rohan de Saram, Tiết’s intense piece exists in a spiritual world that is fundamentally outside the traditions of Western music. He asks the performer and the audience to come to his music with a thoughtful patience unique in my experience as a musician. 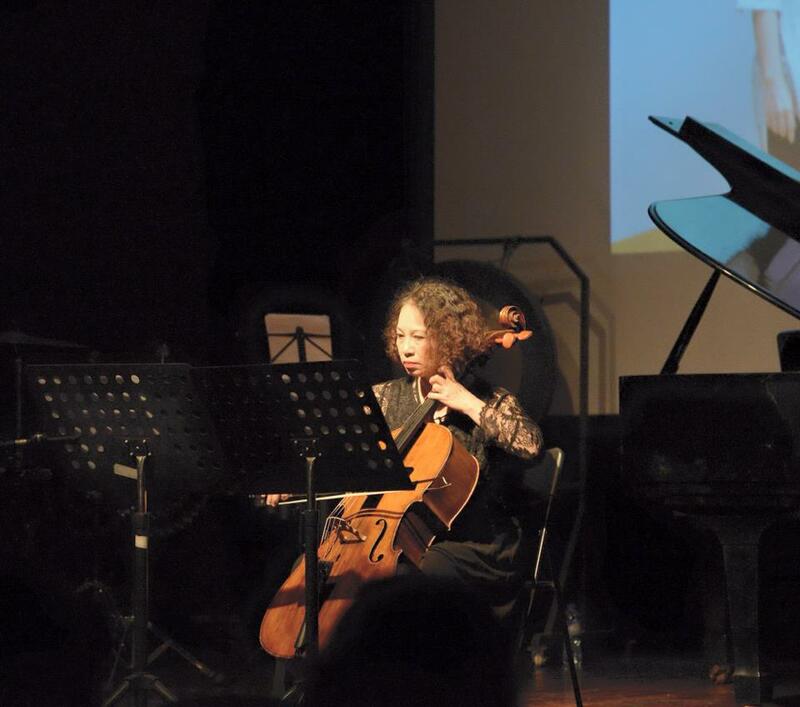 Once the initial technical fear factor wore off, Jan was able to bring cellist Đào Tuyết Trinh full circle, home to her own culture. 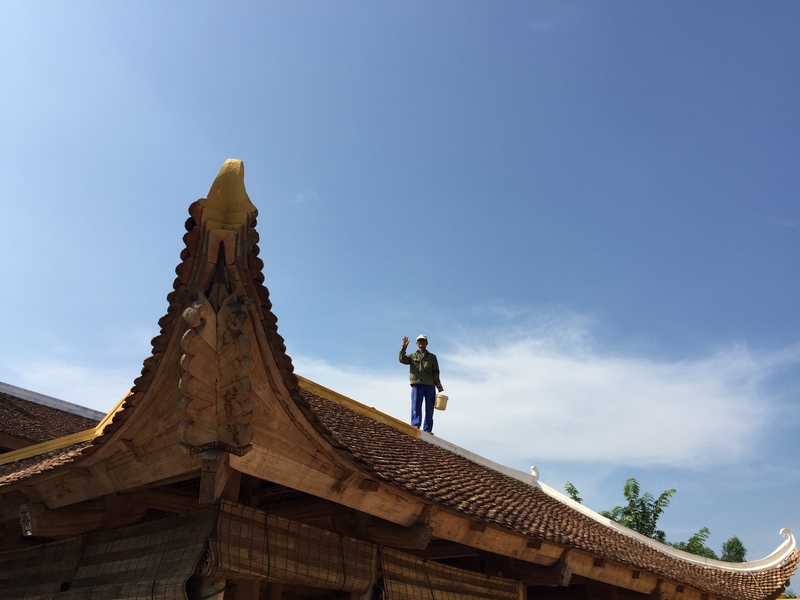 A worker greets us from the pagoda roof of Chùa Linh Am. 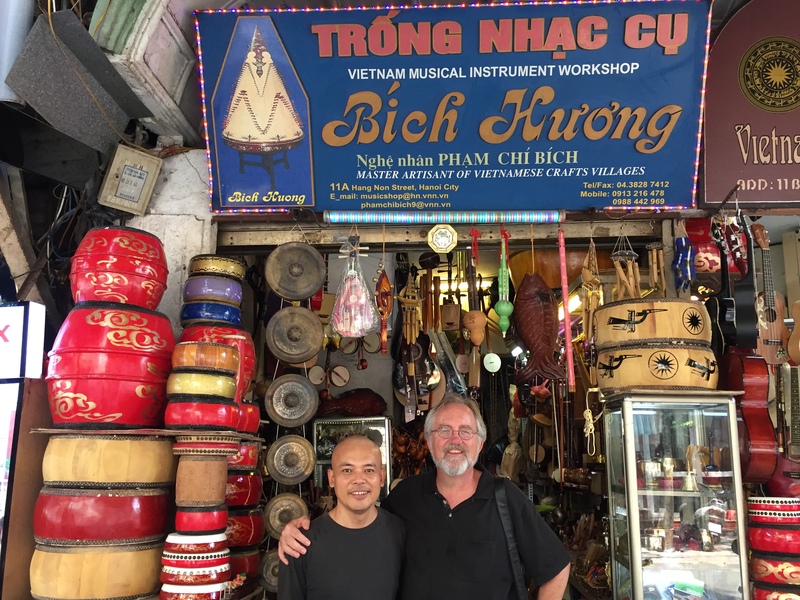 I have an earlier and popular blog about a day spent in Bằc Ninh with my friend Đàm Quang Minh, so search for the post if you are curious to have more background. 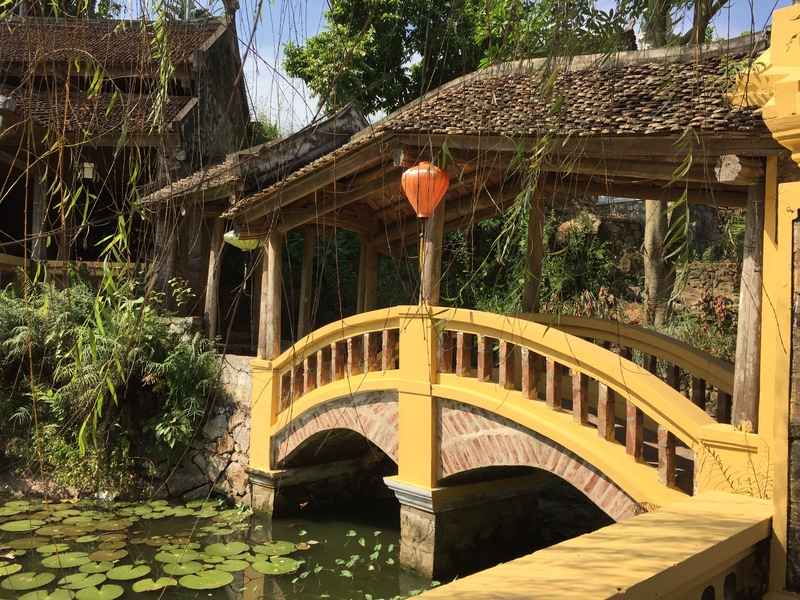 The day was symbolic, as we began at the oldest Buddhist temple in Việt Nam, Chùa Dâu, and ended at one of the newest, Chùa Linh Am, which still had construction workers on its roof shouting cries of welcome to us as we arrived for a late afternoon tea. We were setting the stage for an ambitious musical future framed by the ancient and the new. 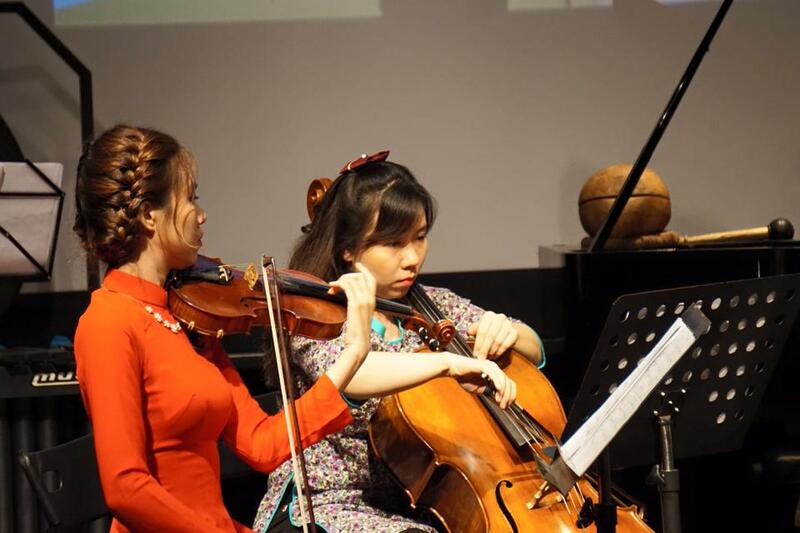 On November 4th we travel from the oldest possible Vietnamese music to a new string quartet of Nguyễn Minh Nhật, who at 19 is studying at the Manhattan School of Music in New York City. There are a lot of reasons Jan and I are in Việt Nam. In foundation speak, the new music scene here has reached a critical inflection point. 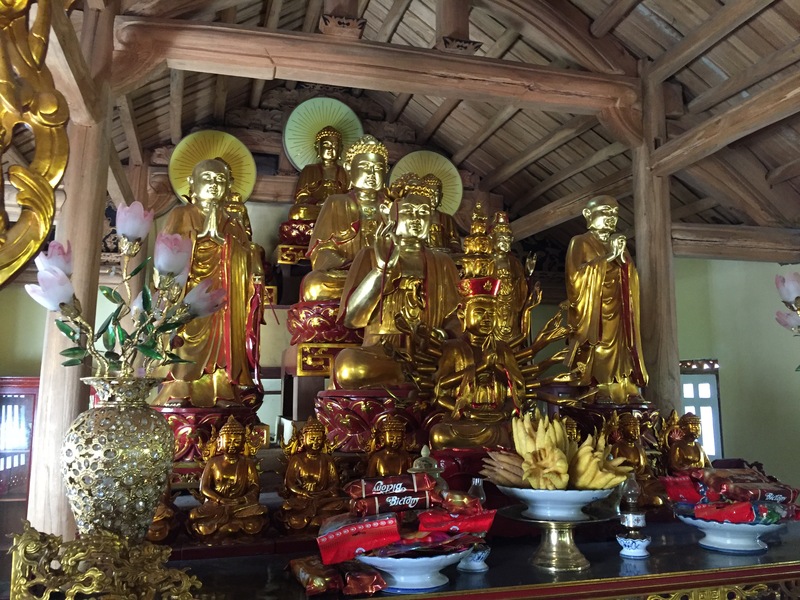 Shining new Buddhas at Chùa Linh Am. 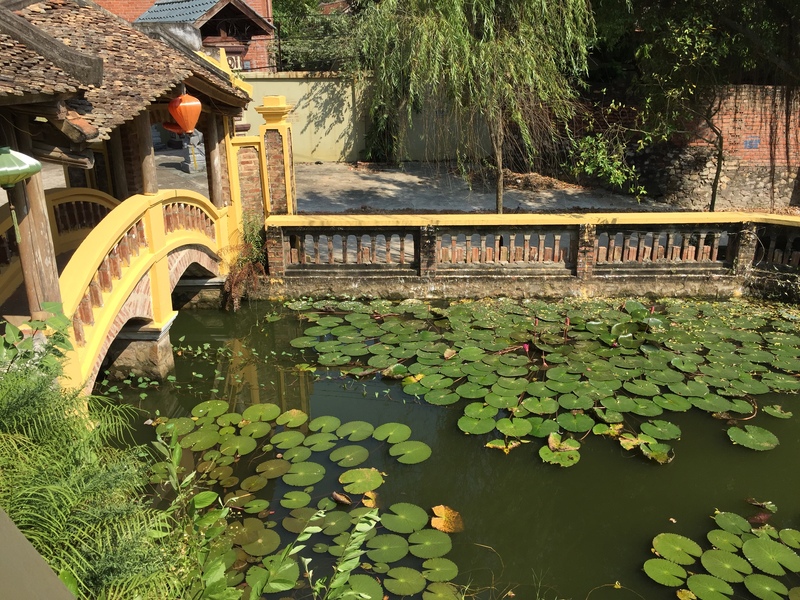 A lily pond at Chùa Linh Am Temple. Finding the true Việt Nam is complicated, a world that is contradictory and often elusive, like trying to grab water. Revealed fold upon fold, however, and I begin to understand that the country is itself in the process of reclaiming its identity, staring into its mirror making a self portrait. I am humbled to be part of this national journey, in a small way, and to watch it mature as time goes on will certainly be a dream come true. 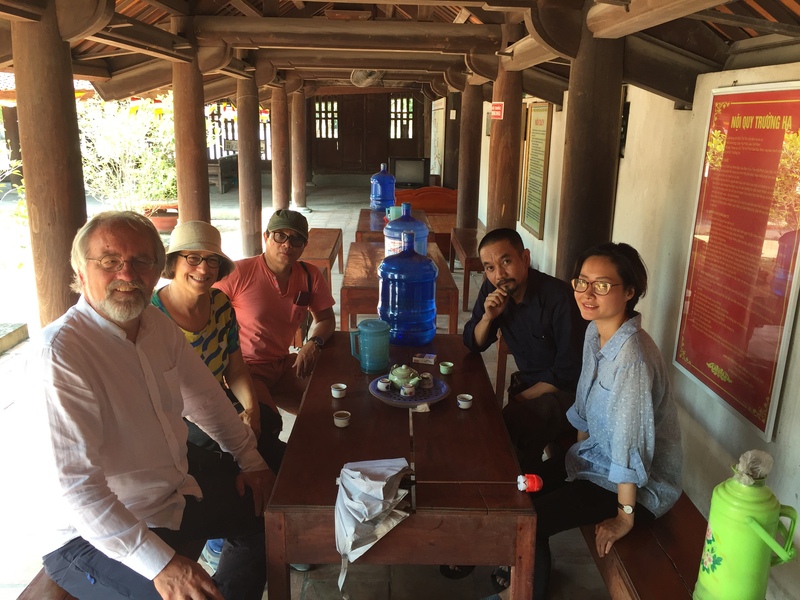 Cementing friendships over tea at Chùa Dâu dreaming of future potential in the 21st century. If you’re in Hà Nội we hope to see you on Friday November 4th at 8 PM in the Grand Hall of the Việt Nam National Academy of Music as the Ancient Music Ensemble of Tonkin and the Hà Nội New Music Ensemble take their first steps together of what I am sure will be a long term relationship.